Before accepting a job offer you need to work through an evaluation process. This protects you from making the wrong career choice. 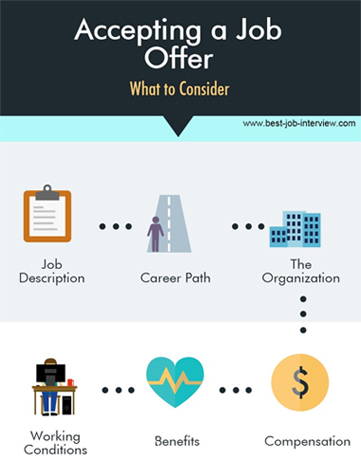 Take these steps to make the right decision when you have been offered the position. First thing is to ask for the job offer in writing. It is always advisable to convert a verbal job offer into a formal written job offer. After you have requested a written job offer, ask the company for the decision date when they need your final answer. Most employers are prepared to give you time to consider the employment offer - they also don't want you to make the wrong job choice! About 3 to 4 days is generally considered an acceptable amount of time. If the employer asks why you require this time you can explain that you want be sure that you are making the best possible decision for both yourself and the company. You can follow this up with a polite written acknowledgment of the job offer. Go to this excellent job offer advice to find a sample letter of acknowledgment of a job offer. Evaluate the offer and judge whether this is the right job for you before sending a letter accepting the job. Use the sample job offer acceptance letter to accept the job in the right way. There are many things to consider when deciding on accepting a job offer. Start with a basic list of your requirements. These are the absolute minimum you can accept - your own "bottom line". Compensation - work out the minimum level of income you need to meet your financial obligations. This bottom line is the lowest compensation amount you can accept. Use the salary requirements calculator to help you with this. Benefits - what are the essential benefits your require? For example is health insurance a necessity and do your dependents need coverage? Working Conditions- what hours are you able to work? Are you able to travel to where the employer is located? If the offer meets this "bottom line" you can move to the next step of the job offer acceptance process. Compensation - now look at factors such as the increase amount over your last salary, bonus, profit sharing, stock options, overtime pay, salary review policy. Health insurance - you have determined that it meets your minimum benefit requirements. Take it further to include the type of health/dental insurance, your financial contribution and the benefits you get. Maternity and family leave - what is the company policy regarding these benefits? Retirement - what sort of retirement plan does the company have? What is the contribution structure and what are the conditions attached to receiving benefits? Location - this is an important factor to consider when deciding on accepting a job offer. How long is the commute? What are the public transportation options between your home and the company? Look at costs of transport - both your own gas expenses or pubic transport expenses. Look at time spent doing the commute. Hours of work - do you want a 9-5 job? What about overtime, meeting deadlines etc? Will you have to work weekends? Is there any provision for flextime? Is there travel involved and how will this be reimbursed? Job description - no matter how good the package is you will become frustrated if you dislike the day-to-day work. Consider exactly what the job involves, what your responsibilities will be and what the expectations of you are. Will the job utilize your skills and knowledge, is the job sufficiently challenging? What do you like about the job, what do you dislike? Is this the sort of job you set out to get when you first began your job search? Career development - what professional development opportunities does the job offer? Is there provision for training, tuition reimbursement? What is the frequency of performance reviews, promotional opportunities? Will this job take you down the road to your career goals? Management - are you going to be able to work under this person? Can you relate to the manager? The workplace - Before accepting a job offer consider the workplace. Will you be happy in such an environment? Ask yourself if it is too noisy, do you have a satisfactory work or office space, is it friendly, too formal or too informal etc? Are your co-workers people you will be happy working with? The company - you need to feel comfortable about working at the company before accepting a job offer from them. What are the company values? Are they compatible with your values and beliefs? Do you respect the type of work the company does? Job security - this is something that should be considered before accepting a job offer - you need to know that the position is a long-term one. Look at the number of years the company has been in business. Look at its profitability, is it growing, what is happening with its competitors? Check news articles for company updates. Get a list of online resources to find out more about the company. Consider the job itself- is it a new position? How successful is the department? Do you have all the information you need to evaluate the job offer? Before accepting a job offer be prepared to ask all the questions that are necessary for you to make an informed decision. Call Human Resources to get information that you may be missing or the interviewer themselves. Use our sample job offer acceptance email or decline the job email to help you with this. Can you Negotiate a Job Offer? Once you have made your final decision let the employer know as soon as possible.